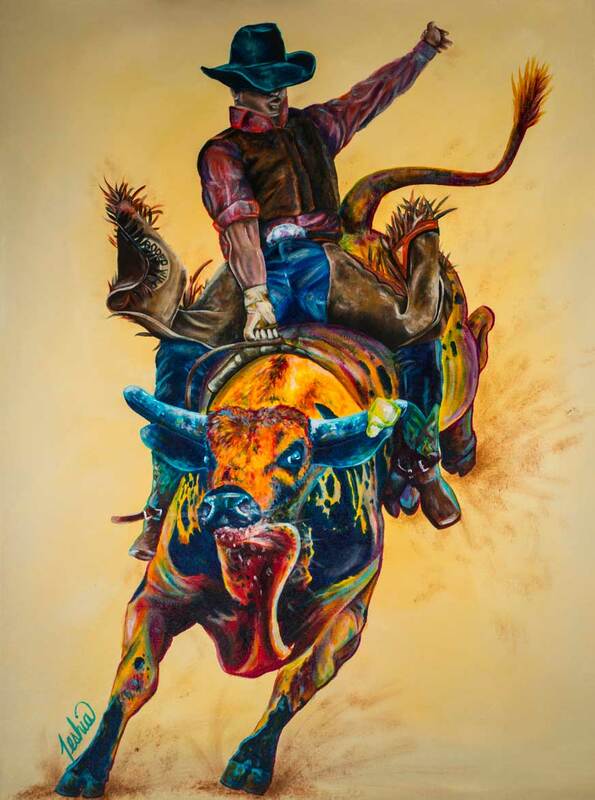 “Rodeo Wild” was created by Teshia in honor of her deep appreciation for the popular sport of bull riding after attending countless rodeos, from Washington to Wyoming! Teshia has always loved the country feel & enthralling energy of being at a rodeo, but for her the real excitement comes when the cowboys climb onto those crazy bulls - bucking with incredible force & power, their muscles raging, mouths foaming & dirt flying! Teshia enjoys infusing energy & life into her colorful, exciting artwork, & with “Rodeo Wild” she aimed to capture that jolting energy, spine tingling excitement, ever-present danger, raw energy, & alluring entertainment that is truly witnessed when one experiences a real rodeo & watches for themselves….the “Rodeo Wild”. She hopes that her latest colorful Acrylic painting will make your heart race a bit faster & leave you on the brink of your bleacher-seat, just as if you were in on the action yourself, front & center. Hang on tight & enjoy the ride!